"I won a gold medal with this recipe at the Armed Forces Culinary Olympics in March of 2007. Serve the souffles with fresh raspberry sauce, if desired." Preheat an oven to 400 degrees F (200 degrees C). Thoroughly grease the the bottom and sides of four ramekins with the tablespoon of butter. Coat with sugar, tipping out any excess. If desired, place a raspberry and a drizzle of chocolate as a "surprise" at the bottom of each cup. 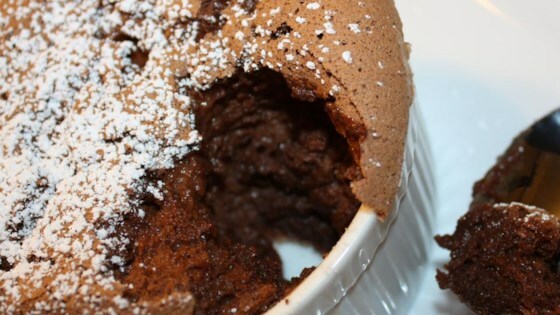 Combine the cocoa powder, cornstarch, and a tablespoon of the sugar; set aside. Mix the butter and flour to form a paste. Lightly whisk one egg yolk in a heatproof bowl. Heat the milk to the boiling point in a heavy saucepan; whisk in the flour-butter mixture until it melts. Gradually pour the hot milk into the egg yolk in a steady stream, whisking constantly. Return the mixture to the saucepan and bring the custard to a simmer over low heat, stirring constantly with a wooden spoon or spatula. About 35 minutes before serving, whip the egg whites until they are thick and foamy and have quadrupled in volume. Gradually mix in the remaining 3 tablespoons of the sugar, whipping until the egg whites are stiff but not dry. Fold 1/3 of the meringue into the custard to lighten it, using a whisk or rubber spatula. Fold in the remaining meringue. Immediately transfer the souffle batter into the prepared ramekins, making a smooth mound slightly above the rim of each ramekin. (If you have a piping bag, you may pipe the mixture into the ramekins.) Bake at once in the preheated oven for 20 to 25 minutes, or until the souffles have risen and the edges are set. Serve hot, with raspberry sauce and fresh raspberries to garnish, if desired. came out perfect, they rose 3 centimeters out of the dish. Perfect texture and taste. I drizzled a chocolate and kahlua sauce on them with rasberries. I did it... today I am officially a MASTER BAKER!! Great recipe and easier than I thought.